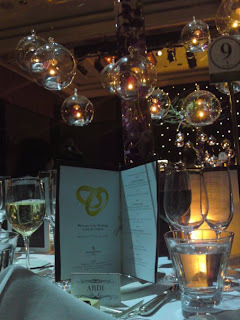 This week, I’m not gonna make a verdict on a particular restaurant, but I’m gonna tell you my experience of eating at my friend’s fantastic wedding Banquet (Congratulations Caro and Joel ^_^) that was held in Four Seasons Hotel, Sydney on the 23rd January 2010. 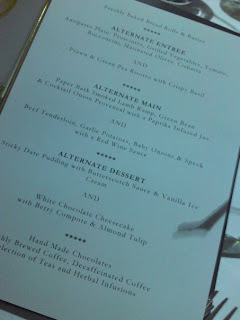 As you can see from the menu above, the dinner was a three-course dinner with cakes and coffees at the end. There is also a choice of red, white, and sparkling wines to choose from. The courses are alternated between guests. 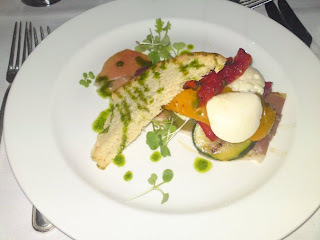 My first course of the night was Antipasto plate. Basically, it’s a plate full of veggies with prosciutto, bocconcini cheese and “carpet slipper” (Italian translation) bread. I couldn’t comment on the prosciutto because I gave it away to Jerry, but the cheese was fabulous. 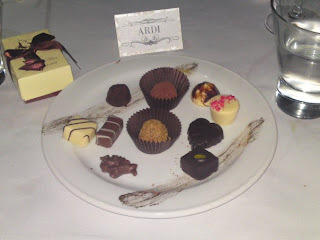 It was perfect bite-size, soft and yummy… Just what I need to build my appetite! 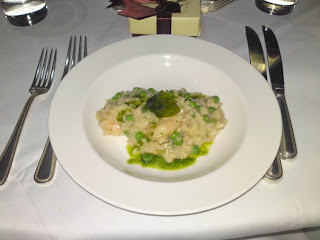 At the other side of the table, they had Prawn & Green Pea Risotto as the entrée menu. I couldn’t really comment on that besides it looked green and prawny. After a few speeches from everyone plus the MC trying to dance or something, the main course was served. This time, I got the Beef Tenderloin in Red Wine Sauce. It was served on top of garlic potates and spinach (I guess). 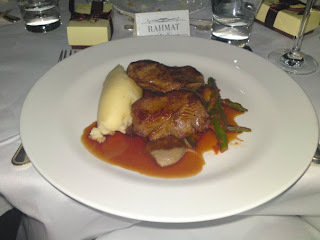 And lucky enough, I had the most perfectly grilled beef of the night (after talking with other friends on the table). The beef was cooked medium-rare, just to my liking, so that it still leaves the juicy and tender taste. 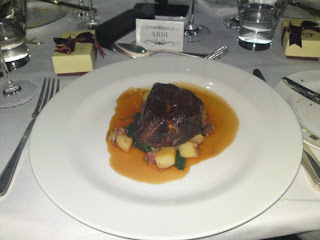 Again, at the other side of the table, they had Paper Bark Smoked Lamb Rump, which I could only take the picture of. 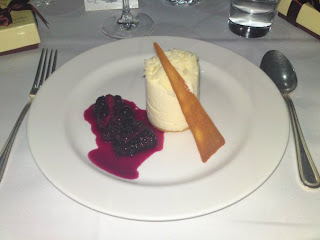 After the dance and a lot more picture-taking sessions, comes the dessert for the night: a White Chocolate Cheesecake with Berry Compote & Almond Tulip. The cake was a combination of the sweet and fruity. 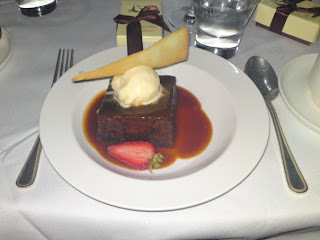 Alternate dessert was Sticky Date Pudding in Butterscotch sauce that they said was really, really sweet. Then, the best attraction of the night came in after dessert, the wedding cake. 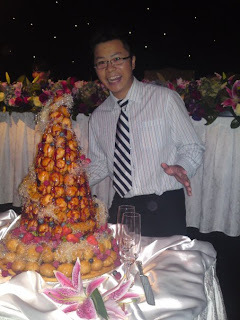 This was not just an ordinary cake; it was The Infamous Croquembouche. Croquembouche, as the French said, means ‘Crunch in the Mouth’. You can literally crunch it then had it melt away in your mouth at the same time. Croquembouche is made of a cone of profiteroles threaded together in caramel with sugar coating and fruits. 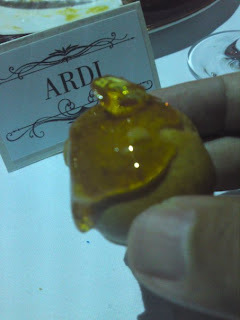 On the second picture, you will be able to see the glassy golden texture of the caramel on the profiterole. Four Seasons has a fantastic lounge that serves daily Crème Brulee. You get a different kind of crème brulee each day (or so they say). It’s really good and also a good place to just chill out after a day’s work.